Ask any early-70s era feminist: all men are animals. While traveling to Africa with his scientist parents, Garfield Logan fell victim to a deadly virus and was saved via an experimental treatment that turned his skin and hair green, in addition to granting him the ability to transform into any animal he imagined. After his parents died in a boating accident, Gar was taken in by the Doom Patrol, a team of misfit heroes that helped him to master his powers. Yes he was, but that's not what this figure represents. How can we tell? Well, for one thing, the Doom Patrol all wore red and white uniforms. 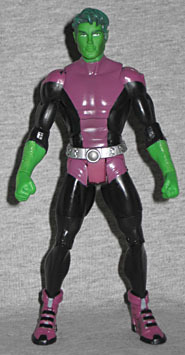 For another, when Beast Boy was on the Doom Patrol, he wore a full-head purple mask. Why a full-head purple mask? Because otherwise people would see his green skin, and his secret identity would be revealed! Even in the DCU, green-skinned folks are pretty rare. Beast Boy uses the same "little" body as Robin and Kid Flash, so he's only 5½" tall. That didn't really work for Wally, but Gar has always been a short guy - even as an adult, he doesn't have the traditional "heroic stature" most capes do. He's the Seth Green of superheroes. Like all the Series 10 figures, he has a surprising amount of new sculpted pieces (since we've been conditioned to expect "none"): the belt is new, but that's just a piece sandwiched between re-used bits; his feet and shins are originals, to create his highly detailed boots; and his forearms are new, for no reason other than to give him sculpted arm-hair. How about that! The purple and black costume Beast Boy's wearing pegs him as being from 2006-ish - after Infinite Crisis and 52, when DC decided pretty much every Teen Titans character had to be redesigned to look like the cartoon. His haircut is modern, with several sculpted layers and lengths that show off the Four Horsemen's skill. They even remembered his pointy ears. The expression is a bit too serious, though: BB is the Titans' resident clown, so he could stand to look a bit more jovial. Beast Boy's only accessory is a green eagle, re-used from the SDCC-exclusive Wonder Twins set (quick reminder: eff you for that, Mattel). It's a nice piece, and it makes perfect sense, but I admit I would have really liked to see more. The re-use potential may not be very high on, say, an armadillo, but a cat could be turned into Streaky, and wouln't Zatanna be even cooler with a rabbit? 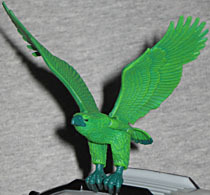 The bird has hinged wings and swivel ankles, and the level of detailing is really impressive: feathers are always a good place for sculptors to show off their skill, but the rough, lumpy texture of the bird's feet is good, as well. These days we're used to the idea that Beast Boy turns into green animals, but that wasn't always the case. 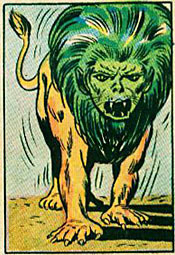 Before he joined the Titans, when he was just a junior member of Doom Patrol, he turned into normal-looking animals... that still had his green human face and hair. It was really disturbing. The switch to "any animal, but it's green" is one of the better examples of shifting powers. Er, that's "shifting powers" as in "his powers used to be one thing, but now they're something else," not "shifting powers" as in "he has shape-shifting powers." You know, like Grant Morrison's secondary mutations. 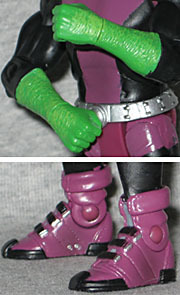 Anyway, Beast Boy also includes the right arm of the Series 10 Build-A-Figure, Imperiex. Imperiex is a forgotten villain from a few years ago, but say what you will about him, he seems to have a pretty visually interesting costume. It's black with pale gold trim, and there's a ribbed maroon panel on the inside of the arm. 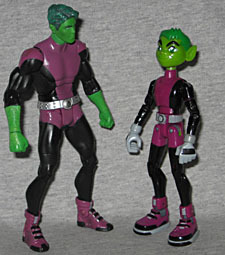 Unexpectedly, Beast Boy turned out to be one of the harder figures to find in this already-rare series. It's a bit of a shame, too, since what could have been a plain, straightforward figure is instead rather unique. He'll fit with either a Teen Titans or Doom Patrol set, both of which are soon to have more members added. The number of accessories could have been better, [go buy your own toy animals and just paint them green --ed.] but the one we got was the right choice. This is a great addition to the DCU ranks.